H.E.S.S. gamma-ray image of SHBL J001355.9-185406. Preliminary. Active galactic nuclei (AGN) are among the most powerful gamma-ray emitters in the observed Universe, and constitute a large fraction of objects seen either by ground-based atmospheric Cherenkov telescopes (ACTs) such as H.E.S.S. or by space-based detectors such as Fermi. Their study provides insights into acceleration mechanisms at play in the environment of supermassive black holes, and they are considered prime suspects in the search for the ultimate cosmic accelerators generating the ultra-high energy cosmic rays observed on Earth. As many other astronomical objects, they come in different flavours, and the BL Lac class of AGN is usually the least luminous but the most energetic. The subclass of high-frequency peaked BL Lacs (HBL) in particular are prime targets for VHE emission. 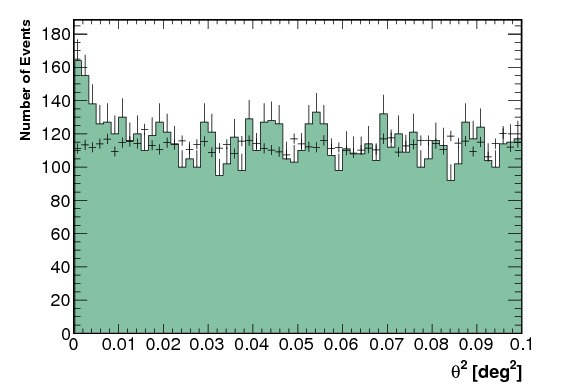 The BL Lac class constitutes ~50% of the extragalactic high-energy (HE, E>100 MeV) gamma-ray emitters detected by Fermi and the bulk of those seen by the current generation of ACTs at very-high energies (VHE, E>100GeV) (see TeVCat). Identifying potential VHE emitting targets is of paramount importance given the relatively little available observation time and narrow field of view of Cherenkov telescopes; the selection of targets is based on large catalogs of multi-wavelength data. The radio to X-ray flux ratio, as suggested by Costamante and Ghisellini (2002), has been a very successful tool so far in this search, and frequent updates to the target list, as more observations become available, are invaluable for this. Initially detected in X-rays by ROSAT (see ROSAT All-Sky Survey Bright Source Catalogue , Voges et al., 1999), SHBL J001355.9-185406 was identified as a BL Lac by Schwope et al., (2000). More importantly, Giommi et al. (2005) classified it as an HBL in their sedentary survey of extreme high-energy peaked BL Lacs (from which stems the prefix of the name used here). With a radio flux of 29.6 mJy at 1.4 GHz, an X-ray flux of 1.26x10-11 erg cm-2 s-1, and a redshift of 0.095, this source was targeted for observations with the H.E.S.S. 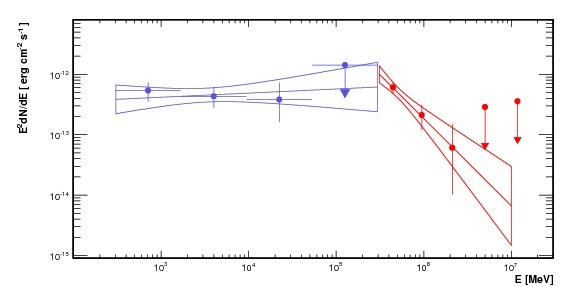 telescopes and consequently reported as a TeV emitter in November 2010 (Hofmann et al., 2010) after 41 hours of livetime (top image and Fig. 1). The subsequent analysis of 3.5 years of public Fermi data at the location of SHBL J001355.9-185406 revealed a weak high-energy counterpart (Sanchez et al., 2010), not present in the first (1FGL) or second (2FGL) Fermi catalogs. This analysis also derived a hard spectrum spectrum which connects well at high energy with the H.E.S.S. measurement (Fig. 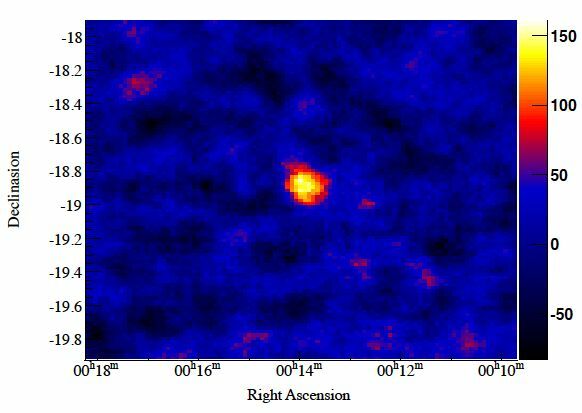 2), as seems to be the case for most BL Lac objects detected in both HE and VHE bands (Abdo et al., 2009). The resulting spectral energy distribution (SED) from 100 MeV to a few TeV clearly reveals a broad distribution peaking around 100 GeV, usually attributed to Compton scattering of relativistic electrons on a yet undefined target photon field. A more complete description of the multi-wavelength SED of SHBL J001355.9-185406 from radio to TeV energies, which exhibits the double-humped structure commonly found in blazars modeled with a synchrotron self-Compton radiative scenario, will appear in an upcoming H.E.S.S. collaboration publication. Fig. 1: Distribution of ON-source events (solid histogram) as a function of the square of the angular distance from the source position. A cut at 0.1 degree is used to defined the source region. The crosses show the background level estimated from off-source regions. Preliminary. Fig. 2: Spectral energy distribution of SHBL J001355.9-185406 measured by Fermi (blue) and H.E.S.S. (red). Preliminary.